Have you ever looked in your closet and ask yourself, “do I really wear all of this?” Well, this happens to me quite often. And to make matters worse, some of those things jammed way in the back still have tags on them. I often take clothing to goodwill, but wondered if I could get money for some of these expensive clothes that are gently used or, in come cases, brand new. Well, thanks to the resurgence of consignment shops, now I can! 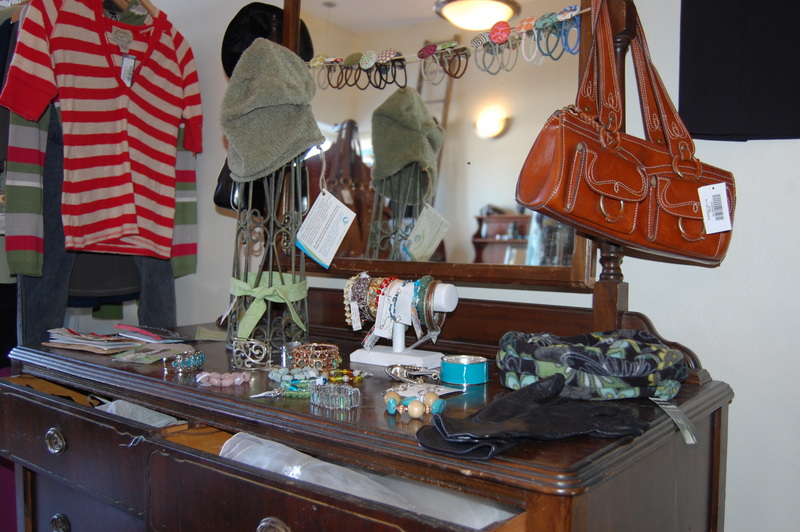 Last summer, a new consignment shop opened in Milwaukee called U-Turn. I dropped off about 15 items and 2 months later they sent me a $74 check! I was amazed and now have made it my mission to go through my closet every couple months to get rid of the things I don’t wear. It is a win-win, my closet gets more organized and I get a little extra spending money. I sat down with the ladies of U-Turn, Deb and Jessica, to ask them about how they run their store and what kinds of things they look for when accepting clothing. Why did you decided to open the shop? Deb and I have known each other since our boys were in senior kindergarten. Deb does finance in the car industry and I am a Speech Pathologist. We were both looking for a change, although we both still work in our professions on a limited basis since opening a business is a scary thought at times! We had been talking and throwing out ideas for businesses one summer night at a friend’s backyard fire pit, but nothing seemed good at the time. Then one fall morning Deb saw me at school drop off, and asked what I thought about a young adult consignment shop. I said I had never really considered it before, but we started doing our research. The next thing you know we were asking family and friends what they thought of various names for the shop and standing in front of the city board with our business plan! Explain to me how U Turn works. What kinds of items will you accept? Although our original intent was to focus on teens and provide both men’s and women’s clothing, we have evolved to offer mostly women’s clothing. We love our faithful men shoppers, but let’s face it, most of the shopping is done by girls and women, so our men’s section has dwindled to a rack or two. We prefer styles that are current. Items that sell quickly are higher end brands and pieces from boutiques – anything different and original. We are not brand specific. Customers love clothing that has never been worn or looks barely worn. As a first time consignor, think about if you or your best friend would still wear it out around town and let that be your guide for if you should bring it in. We accept sizes from 14/16 juniors to Woman’s size 18. We may occasionally turn away a size if we have too much of it in stock, or ask that you hold on to it and bring it back at a later time. How do consignors make money? When we sell an item the consignor makes 40% of the sale. We pay out when their account hits $20.00 or all the items in their account have sold. They just drop off the clothes and we take care of the rest! Do you have any tips for people who would like to bring in clothing and accessories sell? Potential consignors can download a copy of the consignment policy from the website here and fill it out ahead of time. Consignors should have clothing pressed and cleaned and on hangers. It is much easier and faster for us to go through them this way. When potential consignors bring in clothing, they can shop around while we go through the items. The whole process should only take about 10-15 minutes depending on the amount of items you bring in or how busy we are. If a consignor’s items are sold, they can either have the money via check or come to U-Turn and use the accrued money in their account for in store credit. 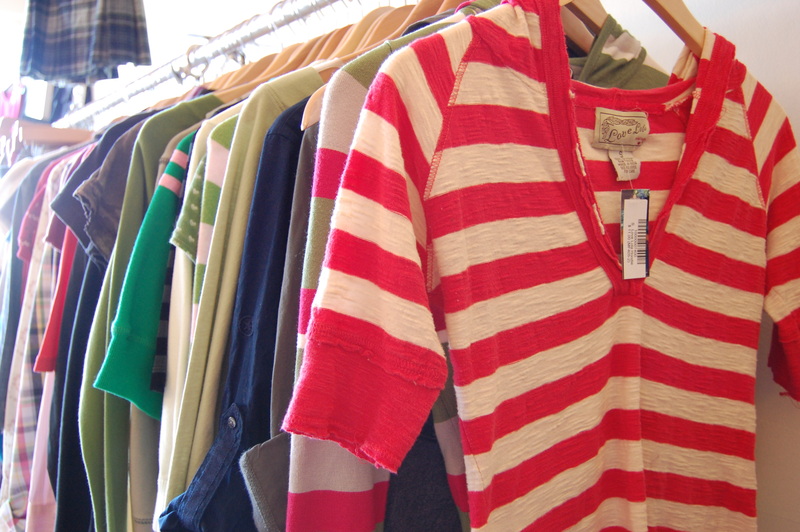 Do you only sell consignment clothing? We also sell items for local artist. We do ask that they use some type of recycle/reuse with their products. We have some great artists in here. I can tell that you try to make your store “green.” What kinds of things to you do to create less waste in the world? We try to make our carbon footprint as small as possible. Our shopping bags are made from tee-shirts donated by customers and friends, a bundle of 10 will get you 5% off one item. If a customer brings back the bag to use for another shopping trip they will get 10 cents off their order. We also do carry a few new line items also that support the environment. 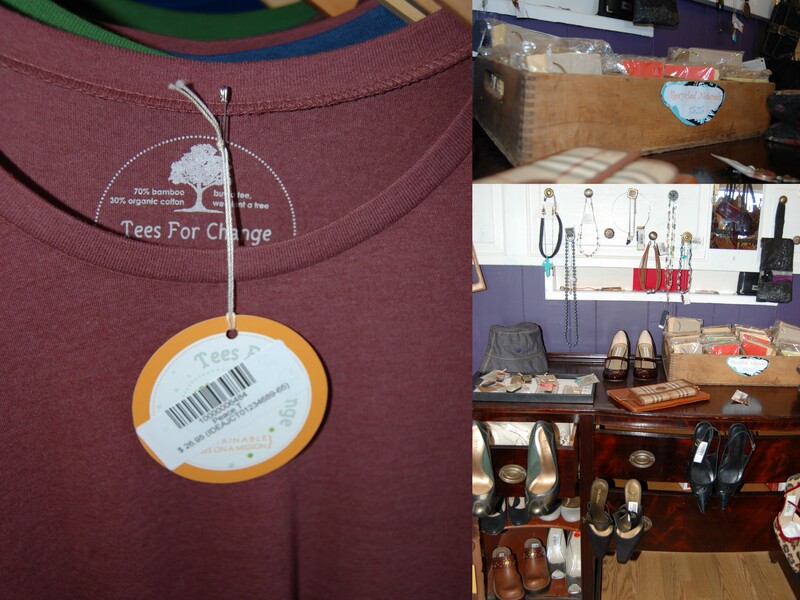 Our Tees for change for example, the company plants a tree with every sale of a shirt. Our snack bags are great for reducing the amount of plastic baggies we use in our lunches. I love the thought of recycling clothing and it makes me feel like I am still helping to minimize my carbon footprint…every little bit helps! And, best of all, I have picked up many unique and one of a kind items at U-Turn. Do you have a consignment shop in your area? Just do a quick internet search…and then go attack that closet! What a great store! I too have many things with tags just waiting for me to fit into.